Did you recently come out of a long term relationship with a person who was supposed to be THE ONE for you? Do you still wonder about how to get your ex back in your life and give your relationship a fresh start? I know that feeling and I also understand how difficult it is to cope with a break-up after you’ve invested so much of yourself into that relationship; more so if you’ve been with that person for so many years together. While you’re sorting this out inside your head, it’s possible that you might also be tempted to contact your ex, or maybe, wonder about what to say if your ex happens to contact you first after your break-up? Guess what, this is quite the tricky part as it will actually decide the future of your relationship. If you really want to get your ex back, you need to be prepared to handle the first conversation with your ex after the break-up. To help you with that, here are my 7 secret tips on what to say during initial contact with your ex. As much as you would want to, it’s highly recommended that you should not be the first one to initiate contact with your ex. Instead, just wait for them to get in touch with you. The real power comes from them contacting you and not the other way around. Frankly, it’s not about the choice of words you pick for the conversation with your ex but about the attitude with which you convey your thoughts. You need to be calm and confident when you speak with them. If you’ve been focusing on the right things in life post your break-up, it means that you’re headed towards a healthy future and that’s going to reflect in the way you speak! If you’ve been working towards improving yourself and achieving your goals, you’re going to notice a positive change in your personality. This will boost your confidence and your ex will be able to notice that in the tone of your voice when they speak to you after all this time. Isn’t that great? So, tell them about how you’ve been working on your fitness goals or enrolled for acting classes! Try it and see how it works like a charm! Sounding miserable is a strict no no! This is the make or break part of the game if you really want to get your ex back in your life. Make sure that you appear calm and not emotional when your ex initiates contact with you. If you think you’re not emotionally ready, do not engage much with your ex. Otherwise, you might start reading too much into their words and get misled into thinking that they want you back. Don’t forget to sound all chirpy and confident when you say that! The best response while talking to your ex in the initial phase of contact is to just act surprised! Show them that you had no idea that you’ll hear from them again and tell them about all the exciting things that you’ve been up after the break-up. Playing a quick catch up and conveying that you’ve been really busy, will definitely make them burn a little inside and probably lose some sleep over it as well. You see, people don’t like to be forgotten easily and it really affects them if they learn that their ex has really moved on quite quickly after the break-up. So, l say let it burn a little. While you might really be excited about them getting in touch with you and speaking to them for hours, that’s not good idea. Avoid going into the details while you interact on the phone or through text messages. Rather, save those details for a face-to-face meet. The key is to stay brief on phone and appear that you just haven’t had time to think about them much. Maybe, it all goes well and you end up having a great conversation with your ex. Do you want to straight away jump into meeting them the very next day? That’s something you should completely avoid as it might make it sound like you’ve been just waiting for them to contact you and you’re ready to jump all in again. So, making immediate plans is not at all recommended. Alright, you must be wondering about why I’m asking you to flirt after telling you all this while to watch your boundaries? Fair question! But let me tell you that flirting a bit is actually a very important ingredient of this dish. Flirting helps in lightening up the mood of the conversation and it gets rid of all the awkwardness or tension that’s likely to be built up after a painful break-up. When you flirt with your ex, it makes them believe that you’re not stuck in a limbo and are cool with the idea of opening up the line of communication again. So, turn on the heat just a little bit! So, You Think You Are Ready? Now that you’ve read my 7 tips on what to say during initial contact with your ex, it’s time to put it to test. If you follow these tips and do it with finesse, be rest assured that you’re on the right track. That’s the very best you can do to get your ex back into your life and give your relationship the second chance to blossom again. 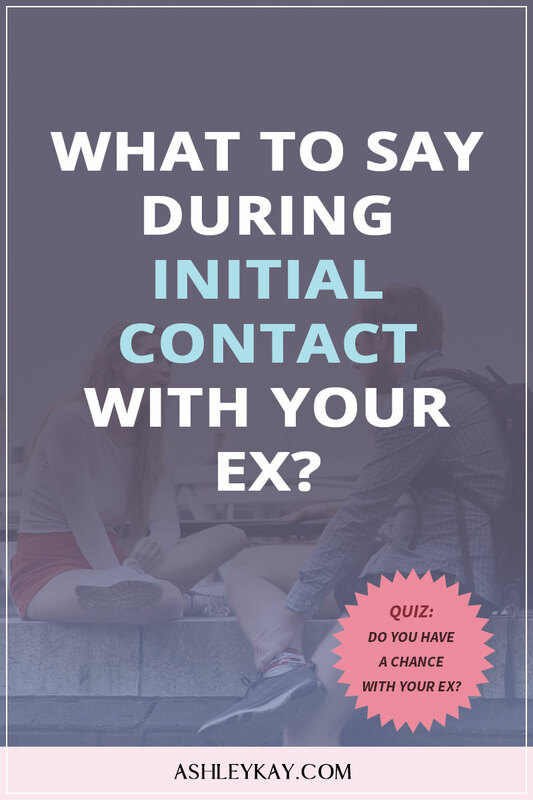 Now that you know what to say during initial contact with your ex, would you like to know about how to get your ex back for good? Previous Post: « Why Is Your Ex Contacting You If They’re Dating Someone Else?